Attract more hummingbirds to your backyard space with moving water. Most backyard birds love to bathe and splash around in a clean birdbath, hummingbirds included! Although they occasionally stop at a shallow bath for a dip, these tiny birds prefer to wet their feathers by flying through or sitting under a gentle spray. 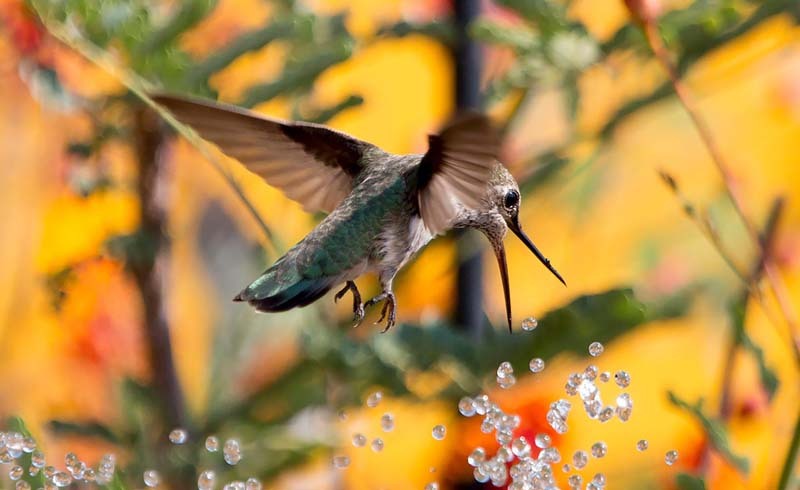 One of the best ways to transform your landscape into a hummingbird hub is to incorporate a moving water feature. 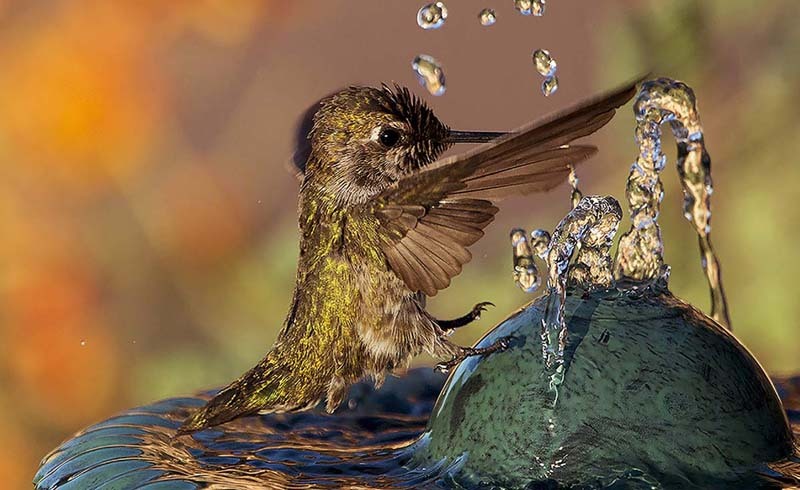 Unlike other birds, hummingbirds want a light shower instead of a complete soak because their primary concern is simply to get their feathers clean. Most of their other hydration needs are met by all the sugar water and liquid flower nectar they slurp up. Hummingbirds rinse off in the rain, at splashing streams or in the spray of waterfalls, and you can re-create the same kind of natural showers they love in your own backyard. It’s easy! To set up an inexpensive solar fountain, you’ll need a basin deep enough to submerge a small pump or hold a floating model. The basin should be wide enough to catch and recycle the falling spray. A classic pedestal birdbath can work; its basin is usually both wide and deep. But because it may be too deep for hummingbirds, you should add stones if needed to keep the water shallow. Maintenance is fairly simple, too. Make sure to keep an eye on the water level, especially on windy days. Refill the basin as needed to assure that the pump doesn’t run dry. The best thing about a solar fountain is that you don’t need an electrical outlet, so you can put the birdbath almost anywhere. Just be sure that the small solar panel, attached by a cord to the pump, is in direct sunlight. The fountain will temporarily stop spraying on overcast days or if a large cloud moves across the sun. Once you have a solar fountain bubbling away, it’s time to amp things up. Add a tiny perch beside it so you can watch one of these busy birds for a few extra minutes as it stops to buzz its wings and contort its body to catch every drop of water. To make a resting spot, choose a slim branching stick (about 4 feet long) with twigs skinny enough for tiny feet to easily grasp. Dead, twiggy branches that fall from maples and other deciduous trees make ideal perches. Push the bottom of the stick into the soil beside the basin to anchor it. It’s even better if part of the branch extends through the spray, so hummingbirds can have a spot right in the droplets. Then just sit back and enjoy some special moments of watching zipping, preening hummingbirds in your backyard showers. Sally Roth is an author and naturalist who loves watching birds take a dip in her backyard birdbaths every summer.